Canadian 1: "Put on your runners, grab your double-double and go pick me up a mickey and a two-four ya keener. Store's only three klicks away." Canadian 2: "Give'r bud don't get yourself in a kerfuffle I'll meet ya by the Muskoka chairs. " Canadian 1: "I'll owe ya two twonies and a loonie but I'll get ya Timmies or a pop next time." It is a beautiful, poetic language, is it not? Canada has two official languages to go with a number of aboriginal languages that pre-date them. Today, English is predominant while French is still largely spoken in Quebec. Many say Canadian French is completely distinct from that spoken in France, and, quite frankly, the English is pretty unique too. 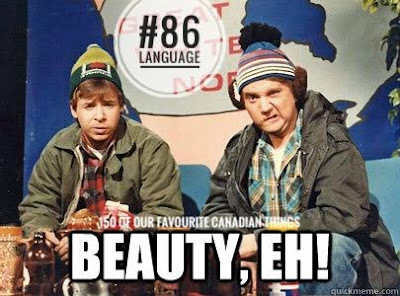 Particularly when you find yourself talking to a Maritimer or someone from the prairies, bunch of beauties they are. Canada's mosaic also means that anywhere in Canada you may hear any number of languages. That said, it only takes a few trips to the hockey rink to have newcomers working in an "eh" or a "bar-downski" into their everyday vernacular. And just FYI, no one says "hoser" in Canada. That was just an elaborate joke we played on Americans to make them sound silly. Boom.